I’ve been watching Paige Barnes work for a long time. She was one of the very first artists I profiled in The Seattle Star‘s Working Artist series, and even before that I had seen her dances many times in both theatrical settings like Stenophobia and more intimate settings like Ayudapii and her series of dance/music improvisations at Open Flight Studio. And it’s no secret that I admire her work greatly. She has always been one of the most eclectic and intelligent dancers in Seattle, and her work reveals a deep thoughtfulness about the connection of physical, musculo-skeletal movement to other things: sculpture, animation, musical scoring, etc. When I first met her, I could tell her work was changing, but neither she nor I could say how. Her piece War is Over for NW New Works Festival marked a point where she had reached a kind of standstill. Taking refuge in visual art, she still worked on small pieces but nothing large came forth. By 2012, she’d already mastered her basic questions of form and movement and she was probing for the next question, like the truly restive artist she is. She began to dance solo for quite awhile as if to refine her thoughts, and this finally bore fruit in her lovely piece, Naked at Studio Current. After an uncertain time in which she performed rarely and mostly in quiet intimate places, Ms. Barnes began to turn away from her investigations of the unconscious archetypes and theriomorphism in that work toward even more abstract questions. What is form? What is energy? How do they relate? How does one become the other? These questions led her to investigate the Chinese system of acupuncture and its particular view of the body itself as a field of energy. Having already been an Gyrotonic instructor, Ms. Barnes decided to fulfill a degree in traditional Chinese medicine at Bastyr as well. That decision led her to China itself. It also led to a nearly three-year hiatus in theatrical dancing. With very few exceptions, Ms. Barnes had become reclusive by performer’s standards. When she finally re-emerged with the full-length Palms, it reminded me of Debussy’s comment about the music of Wagner: “A beautiful sunset that was mistaken for a dawn.” With its combination of virtually everything she had explored in her dance work up till that point, Palms marked a close of one phase of her life and work. Even more telling than its eclecticism was the fact that the piece didn’t feature her at all on stage. All throughout her hiatus, however, Ms. Barnes had been studying, studying and studying some more. She had also been dancing informally while in China, recording a dance a day for Instagram. 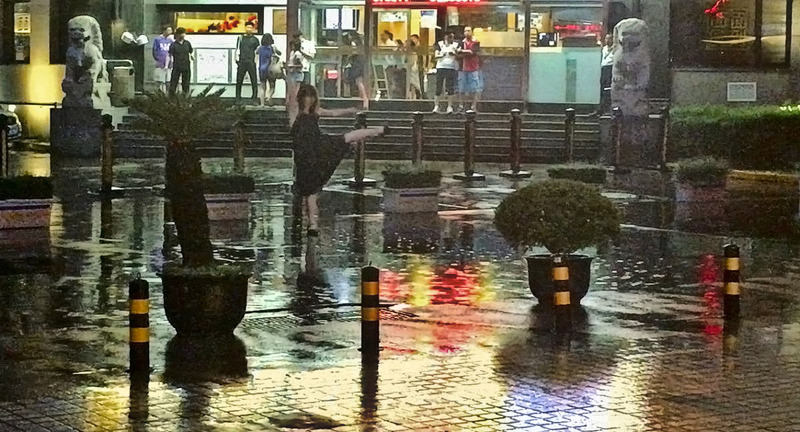 Eventually her pursuit of Chinese medicine began to open a new path for her dance work. Even before Palms itself, Ms. Barnes had been holding what she calls “pulse residency” with a handful of selected people. Inspired by her study of Traditional Chinese Medicine, the pulse residency dances comprised a reading of a chosen person’s pulse and a “response” by Ms. Barnes, an improvised dance based on the rhythm of that person’s pulse. This worked out so well for her that she applied for a residency with the Seattle Art Museum to perform several improvised pulse dances at the Olympic Sculpture Park which then culminated in three large performances in January, February and March of 2017, each complete with music, animation, singing, and poetry. Collectively dubbed The Pulse Performance Project, these pieces seemed every bit as eclectic as her earlier work, but something had changed. They were calmer, more celebratory, more unified in their purpose, yet still as intricate as anything she had ever done. Her latest work, #shanghaipulse collects the films of these shorter pulse readings together with the informal diary of dances from her sojourn in Shanghai. The evening will begin with a series of social media installations throughout the theater, followed by a screening of the dance videos created while studying in Shanghai. Ms. Barnes will then perform a live pulse reading and improvisation by reading an audience member’s pulse and creating her response. Following the live performance, there will be a screening of the pulse reading films from her residency at SAM, and then the evening will end with a conversation about “Art’s Role in Building Empathy & Connection,” with Northwest Film Forum’s Executive Director Courtney Sheehan, SAM’s Public Programs Manager Philip Nadadsky, Bastyr University’s Dr. Kathleen Lumiere, and Ms. Barnes herself.